I talk a lot about the driving in Doha. Everyone in Doha talks about the driving in Doha. Nothing special about a "Doha-ite" discussing driving in the ME. It's really no different than a Canadian complaining about the weather. And while the weather can get pretty bad in Canada, -50C pales in comparison to driving in Doha on the overall "horribility scale". Speeding, overtaking, driving on sidewalks, driving in the breakdown lane, traffic jams, letting kids ride unsecured in their seats, driving with kids dangling from the windows or halfway out the sunroof, riding dune buggies down the highway; the list goes on. I've compiled a list of pictures from the commute to and from work last week. Hard to see in the image … but this was a child of about 3 climbing out the sunroof in traffic directly in front of me. Oh, and just for fun, I timed the 12.4 km commute back from work last night: 54 minutes. Yup, a few fit 40-year-olds could run it faster than it takes me to drive it. If I didn't run the risk of getting run over on the way, I'd probably try it myself. 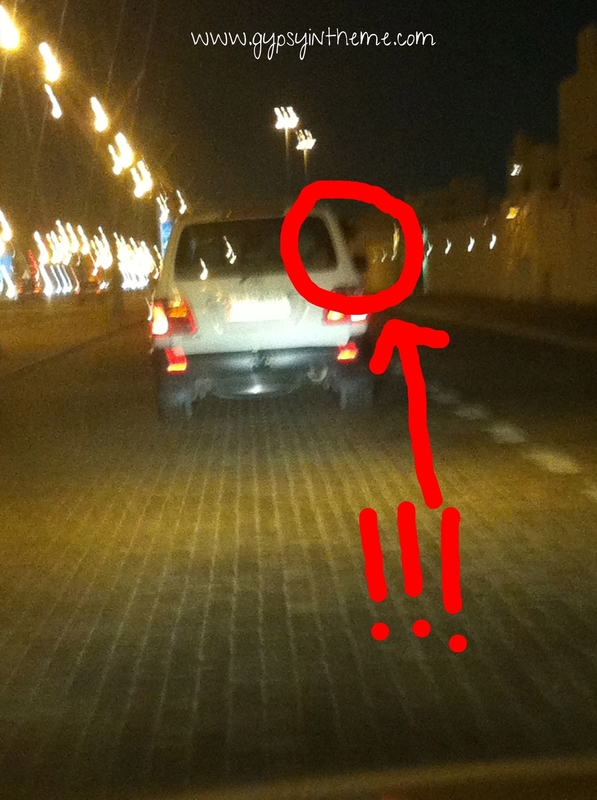 Driving in Doha drives me crazy! resign myself to the fact that the booger he's just carelessly flung onto my windshield is probably going to stay there smack dab in my line of vision for the duration of the ride home. Then I get home and none of what drives me crazy really matters. The nonsense that is my daily commute fades away to nothing; what rattled me to the core a few short moments ago becomes nought but a blip on the frustratometer, a funny anecdote that I'll pull out after a glass or two of vino. Like last Thursday, when after an incredibly long week at work I came home to appetizers, centerpiece, and homemade turkey dinner, prepared by Smilin' Vic and Kiddo, who both had the day off. And just like that, "crazy" became "thankful". Homemade pumpkin pie (even the crust)!